Sunset Rentals on Hilton Head Island offers a large range of Homes and Villas located in Palmetto Dunes. Our 3-8 bedroom Palmetto Dunes vacation homes offer an assortment of private pools, spa's, large porches, garage access, and great views. When you think of Palmetto Dunes, you think of Family. Palmetto Dunes is the Number One Family Resort in the U.S. according to Travel & Leisure Family Magazine. Palmetto Dunes offers 3 miles of immaculate beachfront, perfect for riding bikes, surfing, swimming, collecting sea shells, or relaxing with a good book. The Abbington Villas are located directly across the street from the beach and offer views of Palmetto Dunes 11 mile lagoon system. The Villas have a modern designs with vaulted ceilings. The Abbington Villas have access to the Hampton Place pool and beach access. Beach Villas, located within Palmetto Dunes Resort, is directly on the ocean and are steps away from an on-site pool, which is open April through September. All beach distances are measured from the center of the complex. The Captains Walk oceanfront complex has an on-site pool, a kiddy pool, a cabana, a sun deck, and a boardwalk to the beach. Pool is heated March 1st - April 30th and October 1st - November 30th. All beach distances are measured from the center of the complex. Hampton Place is the Dune's newest resort and has luxurious amenities including two large pools with sundecks, a child's pool, and a hot tub. A new fitness center is now available to guests of this complex . Outside showers are located near the beach, as well. Beautifully landscaped grounds, with private walkways throughout, take you to the picnic tables and gazebos near the oceanfront. Pools are cooled from July 15th to August 15th, and heated from March 15th to April 30th and October 15th to November 30th. All beach distances are measured from the center of the complex. The Huntington Villas have screened porches , modern design, and are spacious. There is a complex pool and Spa. The pool is heated Oct, Nov, March & April; the hot tub is heated year round, except for the month of January. These Villas are right across the street from the beach and are a quick 5 min walk down to the Atlantic Ocean. The Inverness Village area of Palmetto Dunes Resort has an on-site pool, which is open April through September, on-site tennis courts, views of the Fazio golf course, and a short bike ride or a 10-minute walk to the beach. All beach distances are measured from the center of the complex. The Moorings complex, within the Palmetto Dunes Resort, is very close to the beach and also features an on-site pool that is open April through September. The Moorings complex is not equipped with elevators. All beach distances are measured from the center of the complex. The Queens Grant section of the resort has an on-site pool that is open April through September, is a short bike ride to the amenities of Shelter Cove, and is a 10-minute walk from the beach. All beach distances are measured from the center of the complex. St. Andrews Commons has an on-site pool which is open from April through September, and is only minutes away from the beach. All beach distances are measured from the center of the complex. 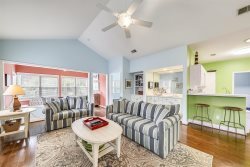 The Turnberry Village area of Palmetto Dunes Resort has an on-site pool that is open April through September, views of the Fazio golf course, and a short bike ride or walk to the beach. All beach distances are measured from the center of the complex. The Wendover Dunes community offers garage parking, a private pool area with Jacuzzi, children's' pool, grill area. The Wendover Dunes complex is oceanside and a very short walk down to the beach. Located within Palmetto Dunes Resort, the Windsor Place/Court complex offers upscale oceanfront villas, covered parking, elevators, a private pool, cooled July 15th to August 15th, and heated March 15th to April 30th, and October 15th to November 30th, kiddie pool and beautifully landscaped grounds. All beach distances are measured from the center of the complex.